I just returned from my first trip to Chicago. Yes, Im lame. I cant believe I havent made it there since I moved to Michigan some 20 years ago. But I finally made it, albeit it was a working stint and I barely made it past the walls of Union Station. Here we are with our booth all set up. Note the time on the clock...6 a.m. Arghhhhh. KK and I boarded the Bluewater Line Amtrak train in East Lansing and headed off to Chicago to promote Greater Lansing to all the Chicago commuters on Wednesday evening and Thursday morning. (Heaven help us. 6 a.m. came waaaayyy too early.) 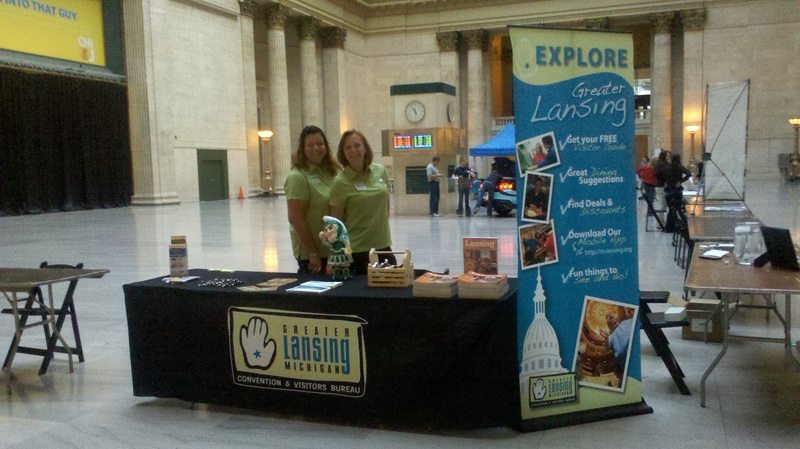 In partnership with Amtrak and Pure Michigan, we were invited to present at Michigan Day at Union Station. I wont bore you with the back breaking schlepping, collating, bag stuffing and ungodly hours that we worked, but suffice it to say that we distributed 3000 packets that included our Greater Lansing Visitor Guides along with 15-20 other Michigan destinations. It was fun to mix and mingle with our cohorts in those cities, too. We had a Greater Lansing booth set up in the Great Hall at the station. Big thanks to Chicagos Union Station, Pure Michigan and Amtrak for pulling this all together. 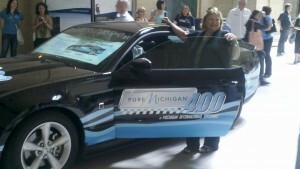 This Pure Michigan car can be yours!